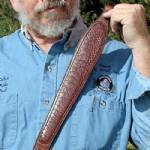 This gun sling is a classic pattern named after the shape of an angry cobra with its hood opened. The sling can be left plain, or it can be decorated with a tooled name or a traditional basket weave pattern or an inlay of exotic leather. Click "View more images" to see medium brown straps with tooled names, a medium brown strap with medium brown ostrich inlay, and a dark brown strap with black ostrich inlay. The body of the sling is cut from supple, sturdy bridle leather. The wide "cobra" shoulder section is lined with suede leather to minimize slippage. The slings are precisely stitched and feature careful finishing and crisp details. Hardware is solid brass, darkened to a soft antique brown. The sling as shown can be adjusted in length from 30" to 38" long, not including the swivel fittings. The sling can also be made to exact length for no additional cost. Blackened steel or brushed stainless 1" swivel fittings are available for additional cost. For the inlays, we stock ostrich shin leather, hair-on cowhide in various patterns, and South Dakota prairie rattlesnake and bull snake. All skins are from non-threatened, non-endangered species. Other unusual or exotic leathers are available by special order. Please note: Snake skin is a delicate leather not suitable for heavy use. For a long-wearing, durable sling, please choose any of my other decorative options. No return or refund on personalized items. If you have questions, please feel free to contact us. Please Select...Adjustable: 30-38" Other: Describe in "Notes"